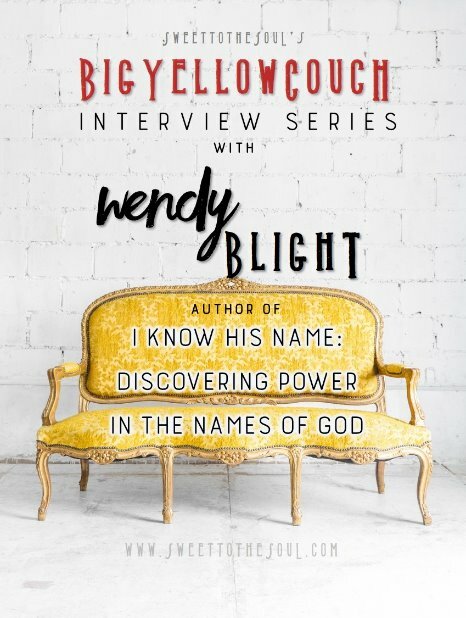 Today we have a special guest on the #BigYellowCouch, author, speaker and Bible teacher Wendy Blight. 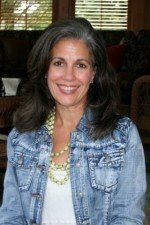 ​Wendy is a member of the Proverbs 31 Ministries’ First 5 Writing Team and serves as the Proverbs 31 On-Line Bible Study Small Group Ministry Training and Development Coordinator. She is a national speaker, Bible teacher, attorney, and author of Living So That: Making Faith-Filled Choices in the Midst of a Messy Life and Hidden Joy in a Dark Corner: The Transforming Power of God’s Story, both featured as Proverbs 31 On-Line Bible Studies. Her newest book, I Know His Name: Discovering Power in the Names of God, just recently released in February. We had the privilege recently of chatting with Wendy, even though she was not feeling well, about Bible study, prayer, writing books and not winning the lottery. 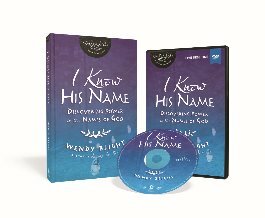 STTS: Wendy, in your latest Bible Study, I Know His Name, Discovering Power in The Names of God, you teach about several names of God; if you had to pick one of God's names that you call out to most, which would it be? ​WB: I think the one I've called out to the most since I've learned the names of God is God The Healer, Jehovah Ropha. And I think it's because I feel a real call - and I have for the last, oh I don't know how many years - to pray over others for healing. ​I had a pastor pray over me and anoint my hands for healing and I just have a real heart to pray for people for healing. Even though it may not be what I personally call out for, but I think that is my favorite name of God and the name I've seen Him most interact in my life personally and in the lives of others. STTS: Do you have a favorite resource that you use besides the Bible? ​WB: I have to say that Logos Bible Software is great. But I also have commentaries that I love, like Matthew Henry Commentary and John MacArthur Bible Commentary. One of the easiest things to do when I'm first starting out on a topic, I just Google the topic and see what I find out there. Sometimes it points me to some great resources. A Google search is a great way to start, then jump into all of your Biblical resources. But when you Google, read through because you can get different perspectives so look at their sourcing and know who they are, look them up. STTS: What is the last thing you did outside of your comfort zone? ​WB: Going to Israel. It was so far outside of my comfort zone because of the kind of place that it is and the flight over there, because I don't really like to fly. But my daughter got to go with me, which was such a God-thing. Once I was there, neither one of us were afraid, and that's what was such an amazing thing. I just had this peace like it's where God wanted me to be. And while we were there Lysa TerKeurst allowed me to go with a very small group to Shiloh, where the Tabernacle stood. And not only did I go and get to see that and stand where the Ark of the Covenant was and where the Holy of Holies was, but then she allowed me to teach on the Tabernacle at the Garden Tomb. These are probably two of my most amazing ministry experiences. For God to open the way for me to not only go but to be teaching on that topic was amazing. 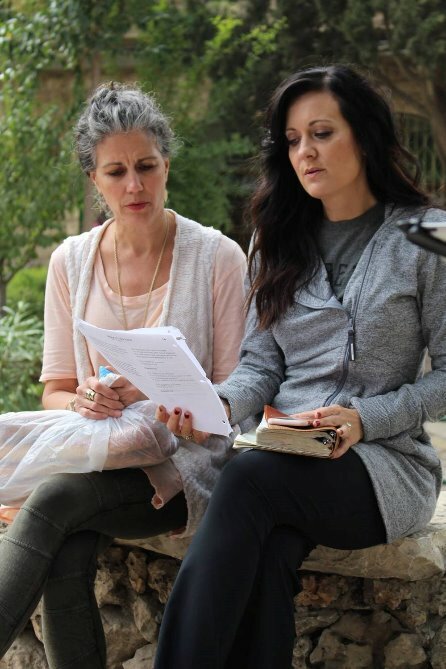 Wendy Blight with Lysa TerKeurst preparing for teaching at The Garden Tomb. ​STTS: You write beautiful prayers that you share with your community, how do you keep track of your personal prayers and answers? WB: Every time I write a prayer, I have a file folder on my computer that I put it in. And then I have a workbook, Prayer Portions by Sylvia Gunter, divided into sections. I really study prayer because I love it. And the more you study it, the more you will get the scriptures. I have started doing this new thing. I divide my prayer journal up into days, Monday - Sunday, and I pray for my family and close friends on Monday, for the Proverbs team on Tuesday, etc. But the new thing I've added is when I am reading my chapter of the Bible each morning, I look for a verse. I just ask God, "would you show me a verse that I can have for this day? ", then I write it at the top of my journal page before I write my prayers. And it's been amazing! The first few days I did this, the scriptures were exactly the right thing to be praying for those people. Those are the times you really begin to see God weave His Word into your prayers. to whatever it is that is going on in your life. STTS: Being a writer, speaker and Bible teacher, with a world wide audience, you have to opportunity to speak on many topics, but if you could give the world only one message, what would it be? ​WB: You probably won't be surprised when I say this but, God's Word is the answer to whatever it is that is going on in your life. Whether it is negative, hard, a trial or struggle. Even if it's the most delightful, wonderful thing, then praise God for it and be so thankful with a heart of gratitude, because that gratitude in turn brings such joy to our lives. STTS: Thank you so much for answering our questions today, we just have one more. What question do you wish someone would ask in an interview, but never get asked? ​WB: It's not really so much a question, and they couldn't really ask me this question, but have I told you my lottery story? I think this is such a beautiful story now - in the moment it wasn't! ​ I was the only woman lawyer in an all male law firm. So when all the secretaries and paralegals got together (they were all women), they invited me to participate in buying this lottery ticket. I didn't have the $5.00 so I told them I would join in next time. And then the next morning I found out they won $33 million. It was the most surreal unbelievable feeling and when I called to tell my husband, it was just utter silence. But I can tell you without any shadow of a doubt that if we had won that lottery money I would have stayed in Dallas, I would have kept practicing law, I would have never moved to Charlotte, I would have never been a part of Proverbs 31 Ministries, would have never started writing and teaching. God has given me so much more than I ever could have had if we'd won that money. I have the perspective to see that now, but that was not my attitude at first. I was not holy! Soul Friends, I hope you have enjoyed our chat with Wendy Blight today. Join Wendy on-line in March and participate in Proverbs 31 Ministries first Bible Study Class! But hurry! Registration closes Saturday, February 27. Click on the link below to learn more and sign up for this personal, in-depth Bible Study class with Wendy. Do you want to go from simply knowing about God to really knowing God? Wendy Blight most enjoys helping women, through Bible study, gain confidence so that they can tackle life’s problems through God’s Word. Wendy has been a featured guest on Oprah Radio, the 700 Club, Family Life Today with Dennis Rainey, Revive our Hearts with Nancy Leigh DeMoss, and Building Relationships with Dr. Gary Chapman. Wendy’s favorite place to be is at home in Charlotte, North Carolina writing and enjoying time with her husband, Monty, and their two children, Lauren and Bo. You can connect with Wendy through her website at http://www.wendyblight.com and through Proverbs 31 Ministries. Loved this! Love Wendy's heart. I've had the joy of hearing her in my home church. She is a precious woman of Faith. I am encouraged by her word today. Thank you Jana! Jana, thank you for inviting me to visit with you on the Big Yellow Couch!! Reminds me of when my daughter Lauren and I used to watch a kid's show called "The Big Comfy Couch!" I am so grateful for how generously you have shared your gifts and talents and prayers to help get the message out written in the pages of "I Know His Name!" I pray God continues to bless richly the work of your hands and your heart as you serve Him. Thank you Wendy for sharing with everyone. It is such a blessing to get to help tell everyone about "I Know His Name" I am so excited to see how God moves in the lives of the women through you new Bible Study. Hi, Wendy! I love your lottery ticket story! Your heart for God's word inspired me to dig in deeper and study the meaning of names and places. Thank you. Your study sounds wonderful. Wendy, I love that your favorite topic is God's Word. Mine, too! Thanks for the prayer resource and the prayer journal ideas.